Container Tracking is a module in TrakIT that displays the list of all containers that are being tracked between the defined entry and exit events. Based on set parameters, the days elapsed and demurrage is calculated for each container. For every corridor, users can set demurrage rates for a specific carrier, shipment type, container size and container type. Slab days and rates can be set if the demurrage rates vary with time. Demurrage rates set here do not have any effect on their own. They are applied only to containers that are present in the Container Tracking list. Admins can set specific events in a corridor to be the Entry and Exit events for Container Tracking. When an Entry event is populated in a work order either directly or via email/bulk update, the container is added to the list of active containers if it is not already present there. Allowed free days are copied from Demurrage Definitions section of the work order that caused the entry of this container and the number of days are counted from the time of entry, which is the same as entry event date/time. TrakIT then starts calculating demurrage on this container on the basis of the criteria defined in Demurrage Definitions. Conversely, when a user populates an Exit event, TrakIT checks if it is an active container in the Container Tracking list. If so, the exit date is set, final demurrage is calculated (if applicable) and the container is "exited" from the list. Demurrage definitions and exit work order number and date for a particular container entry can be modified by clicking on the menu icon beside it. The Entry and Exit events may belong to same or completely different corridors. For example: Entry event would be in an Import corridor and Exit would be on the Export. The list can be exported as an Excel sheet as per the selected filters. These notification emails are sent out by TrakIT every morning. The email contains an attachment that lists all the containers with Free Days already expired along with calculated demurrage provided demurrage rates for the corridor were set and containers about to expire as per the above settings. Users can also be subscribed to demurrage notification emails by administrators via the Corridor Definitions > Demurrage Definitions section. Subscriptions made by admins are automatically reflected in the user's Email Notifications and subscriptions made by users in Email Notifications are reflected in the Notifications section in Demurrage Definitions. Using the Container Tracking module, users can keep track of their containers along with the demurrage applicable on them in a very easy manner. For any questions or clarifications, please contact TrakIT Support. Key Performance Indicators or KPIs, are the primary means of measuring the performance and timeliness of your shipments in TrakIT. This article covers how KPIs are defined, how they are calculated and what they mean. In TrakIT, a KPI basically measures the time difference between two specific events in a work order. This difference can be compared against a target value and can provide alerts to users if the target is not met or matched. The KPI can be measured in running hours/days or business hours/days. TrakIT contains a table of Base KPIs that are defined by System Administrators. The Base KPI is simply a name of a KPI and does not contain any specific information about events or targets to measure. The reason for having base KPIs is to have the same KPIs available globally. This enables and promotes standardization and comparison of KPIs among different corridors or regions. Shown below is a sample of the base KPIs table defined. To see this list for your TrakIT, go to Admin > Master Tables > KPI Definitions. Base KPI - This is where the KPI name is selected from the list of pre-defined base KPIs. From/To Event(s) - The KPI measures the time difference between the "From" and "To" events that are specified here. The event codes are entered into the boxes and more than one event can be specified as long as they are separated by commas. When more than one event is specified, TrakIT will only use one of these events based on the option selected: First Found means that TrakIT will search the work order events in the order specified and use the first event that is found with a date. For the Earliest and Latest options, TrakIT will select the appropriate date after checking all the events specified. If the "Use current date if unavailable" option is selected, then TrakIT will substitute the current time for the From or To event when the event itself contains no date. Business Hours - This option is specified when the KPI is to be calculated in Business Hours instead of running hours. 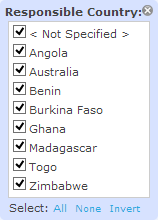 When this option is selected, a country and time-zone must also be specified. TrakIT then uses the holidays and weekends defined for the country to calculate the correct business hours between the From and To events. Holidays for a country can be defined through System > Holidays. Active - By default, a KPI is active. De-activating a KPI will prevent it from appearing in new work orders that are created after the KPI is de-activated. It does not have any effect on existing KPIs already present in work orders. Exclude from Reports - This option can be selected if the KPI should not be included in certain interactive reports or if the KPI is not a reflection of the actual performance. 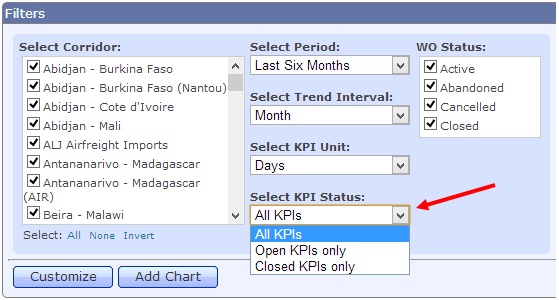 Users can set alert requirements for the KPI when it exceeds or is less than a certain number of hours. This number can be negative as well and is called the Target of the KPI. Once a KPI is final (i.e both From & To events have been populated), it stops providing an alert warning unless the "Alert Despite Completion" option is selected. Users can also set the KPI alert to appear only when certain other Events or Data items in the Work Order are Completed or specifically Not Completed as per event codes entered in the available boxes. Once the definition for a KPI has been set, you can choose to apply the new (or modified) definition to all existing active work orders. 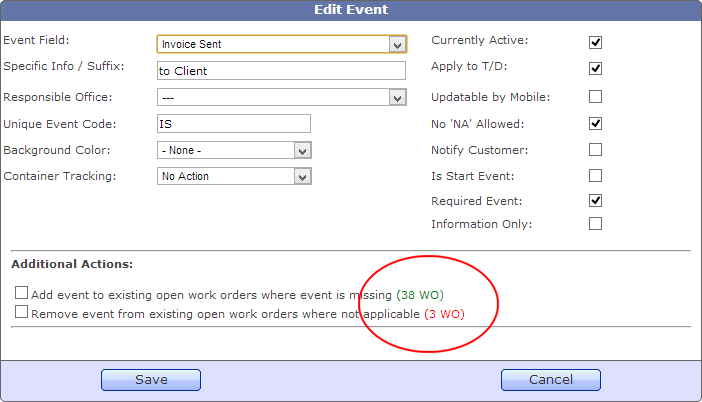 When the Target value is changed, the option can be selected to update the target on all active work orders. Once a KPI has been defined in a corridor, it can also be linked to specific services for the corridor - just like Events and Data for the corridor. KPI - The name of the KPI appears here along with a status icon indicating the alert level. A icon indicates no alert, a icon indicates an active alert and a icon indicates a snoozed alert. Start - The date of the "From" event is displayed here if available. If the event date is set to use the current date, it is indicated as Current. End - The date of the "End" event is displayed here if available. If the event date is set to use the current date, it is indicated as Current. Target - The Target set for the KPI as per the Corridor Definition is displayed here in days and hours. Actual - The actual calculated value of the KPI is displayed here. This value can be calculated only when both the "From" and "End" events can be determined. If the actual value exceeds or is less than the Target value (as defined in the KPI definition), it appears red. A red value may or may not cause the KPI to go into alert status depending on other conditions selected in the KPI definition. Closed - A 'Yes' in this column indicates that both the Start and End event dates for the KPI are available and the KPI value is constant (as opposed to a KPI value that changes with time). Snooze Till - If a KPI in an alert status has been acknowledged by the user, it can be put into a "snoozed" state until a certain date has passed. Just specify the date in this column and click on the 'Save' button. Such KPIs appear with a icon. Once the date passes, the KPI state changes back to an alert state. Apply to T/D - This can be selected if you wish to snooze a KPI in all work orders of the shipment. Snoozed By - Indicates the user ID of the person who put the KPI into the snoozed state. A KPI that is measured in business hours is indicated in italics. Both the Target and Actual values are in business hours (1 business day = 8 business hours). Users can subscribe to receive email notifications when a KPI goes into an "Alert" state. To do this, go to System > Email Notifications. Select the corridor for which you want to see KPIs, select the appropriate KPIs and click on the 'Update' button. Users can add KPIs to their Dashboard to view the performance of the KPI in a graphical trend chart. Such a chart is a very clear indicator of performance trends. For more information on how to setup your personal Dashboard, take a look at the Dashboard article posted a short while ago. KPIs can form a valuable tool to monitor the performance and timeliness of events in shipments. KPI names are global but each corridor can have it's own set of specific KPIs that can be configured as per the corridor's requirements. KPIs appear in work orders and can signal alerts and email notifications for users. A KPI can also be put into a snoozed state for a few days. KPIs can be added to user's dashboard to see a graphical overview of the KPI's performance. If you have any questions or concerns about KPIs in TrakIT, please contact TrakIT Support. With the latest update of TrakIT, we've introduced a nifty new feature with which you can create any number of work orders by simply populating an Excel template and emailing it to TrakIT. Go to the Home page in TrakIT and download the New Work Order Template document from the documents section. This template contains some basic fields for new work orders that you can populate. More fields may be added in future versions of the template depending on your requirements. Customer Code Customer Code is a mandatory field and must match the Entity Code of the customer in TrakIT. The code specified here must be a unique code. Unfortunately, we currently have duplicate codes for some customers in TrakIT (these will be cleaned up soon). Codes that are not unique will fail. Carrier Code Code for the Carrier is also a mandatory field and must match the Entity Code of the Carrier. Transport Document Transport Document (or Shipping Instruction or Bill of Lading) is again a mandatory field. If this number is not available, it's not advisable to create work orders via Excel, as any temporary random number you might enter could already be a shipment in TrakIT and the new work orders would then belong to that shipment. Container/Manifest No. Depending on whether the shipment is containerised or break-bulk you can choose to fill in either of the fields or leave both blank. Container numbers specified here are not validated. If none of the fields are specified, TrakIT will create a TBAUxxxxxxx container number as usual. Container Type Choose Container Type from the drop-down list provided. The list matches the container types already available in TrakIT. Size/Weight Size of the container can be selected from the drop-down as 20' or 40' and the weight can be specified directly as a number (in kilograms). Both fields are optional. Shipment Type Choose Shipment Type from the list of available Shipment Types that will be available in TrakIT. Seal Number and Commodity Both fields are optional and can be entered as free text. Currently, it's not possible to set the services for the work orders in this template. But we intend to include this in the template's next update. The subject of the email is not case-sensitive. Send the email only from your registered TrakIT email account and make sure that you have the correct authority to create work orders. Otherwise, the work orders will not be created. TrakIT will process your email and reply with the result. TrakIT will inform you about errors encountered if any and the rows on which they occurred. As this is the first release of this feature, we look forward to your feedback for improvement. For any questions, concerns or suggestions, please contact TrakIT Support. The TrakIT Dashboard is a powerful tool to evaluate the performance of your corridors. It provides you with a graphical overview of your shipments, KPIs and event occurrences in an easy to comprehend manner. There are various kinds of charts that you can add to the Dashboard for selected corridors, time intervals as well as trend intervals. Similar to the Operations page, you can choose to customize the filters that apply to the Dashboard to narrow down to specific corridors, shipment types or other parameters. An important point to note is that filters apply to all charts simultaneously. Currently, there are 4 types of charts available in TrakIT. You can add as many charts as you want and re-order them as required. The source data for each chart can be exported to MS-Excel. Hold the mouse over a data point on any chart to display the figure behind it. 1) Work Order Creation - This chart displays a simple count of work orders that were created over a period of time for the selected corridors and for a specified trend interval. 2) KPI Average – This chart shows you the average time measured for the selected KPI against the average target time for the same KPI. It provides a bird's eye view of the trend/performance of a KPI and whether the time interval measured between the events is occurring within the target time. You can add as many KPI charts as required. 3) Event Occurrence Trend – This chart shows the number of occurrences of a specific event over a certain time period and allows users to track the change in events happening over the time period. You can add as many charts as required. When adding an Event Occurrence Trend chart, TrakIT will ask you to choose a specific corridor and event in that corridor. This is only done to obtain the event code of the event. The graph generated includes events with the same event code across all selected corridors (and not just the one selected when adding the chart). 4) Top 10 Pie Chart – This chart shows you 10 most active or most frequently used carriers, customers, corridors, shipment types and transporters. It also helps you identify other performance related information like which corridors/entities are most inactive or not used at all, which in turn allows you to re-analyze the requirement of such corridors/entities in the application and perform clean-ups. You have the flexibility to choose your own charts independent of other users. If you would always like to open TrakIT with the Dashboard (instead of the Operations) screen, just click the star icon on the bottom right corner of the page to make it your default page. (But make sure the shortcut you use to start TrakIT does not directly link to the operations page, or else this won't have any effect). For any further questions, concerns or suggestions on improvement, please contact TrakIT Support. With the latest release of TrakIT, users can now choose to generate forms for all work orders in one go. As you may already know, there are two kinds of forms available in TrakIT: those meant for single work orders and those meant for the entire shipment (with details of all work orders on the same form). The latter are, by default, shared across all work orders in the shipment. 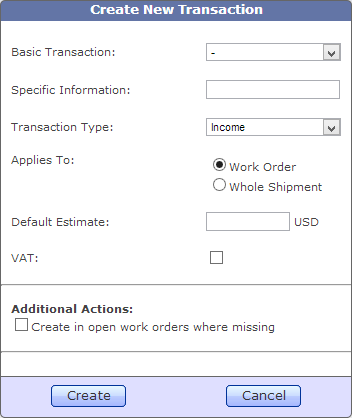 At the bottom, there is a check box that allows you generate the same form for all work orders in a shipment. Once this check box is selected, the form is generated for and attached to each individual work order, and then emailed together in a single email. The important point to note here is that any text fields in the form that are to be filled in by the user, will only be filled in for the currently selected work order and not for other work orders in the shipment. This is obviously because TrakIT cannot know the information that is required to be filled for other forms dynamically. So, this feature is recommended for forms where there are little or no dynamic fields. Please note that using this function may take a lot of time to generate the email, especially if the shipment contains a large number of work orders. If you have any questions of concerns regarding this feature, please contact TrakIT support. The global search function (on the top right side of the main menu), used to search work orders only on the B/L, Container Number, Manifest or Work Order ID. It is now possible for TrakIT to search in Data fields that belong to a work order, provided you have specified that field as a searchable field. For example, if you have a Data field called "Truck Number", you can select it as a 'Global Search' field in the Corridor Definitions and it will be included in search results. However, please use this feature very sparingly and only for unique fields with long numbers (such as Finance Reference numbers or Invoice Ref numbers). If too many data fields are included in Global Search, TrakIT may take a long time to search and the result may include lots of false matches (of which only the first 10 are displayed). Consequently, you may not be able to find what you are looking for. A new filter for the KPI Status has been added to the Dashboard filters that affects KPI charts only. Users can now choose to display All (default), Closed or Open KPIs only. Closed KPIs are those KPIs where both the "From" and "To" events have been populated and the KPI value is final. Open KPIs are those KPIs where the "To" event is not yet populated and the current date is being used to calculate the value of the KPI. After selecting the option, click on the 'Search' button to update the KPI charts. When linking an Event or Data Item to one or more services and/or customers, you can easily check how many work orders your change will affect before you actually apply it to the work orders. When you click on the 'Edit' function for an Event or Data item, the two "Additional Actions" you can apply also indicate the number of work orders that will be affected if the respective check box is selected. TrakIT is now on Facebook! For getting TrakIT news straight to your Facebook newsfeed, simply go directly to TrakIT's new page at http://www.facebook.com/trakit and click "Like"
We're happy to announce that with the latest update of TrakIT, we have begun translating TrakIT in the user's own language. Of course, as you may expect, this is by no means a small task - one that will take many months. But we have embarked upon this journey and will make sure we implement it to the extent where non-English speaking users are more than comfortable using TrakIT. For the test phase of this project, we have picked Spanish and French and at the moment, only the main menus, some common buttons and some tab headers have been translated. Once your choice is made, TrakIT will remember it until you or Admin change it. Please note that all our translations are currently obtained from the internet and we're trying to source a native french or spanish translator. If you find a mistake or can suggest a better translation, please let us know so that we can correct it. Also, please note that translations only apply to the user interface or to static text in TrakIT. For obvious reasons, user supplied data, such as corridor names, event/data names, work order remarks, new articles, etc. cannot be translated. Admins may consider localizing some event/data names if they wish to do so for their corridors. We request TrakIT users to please let us know if they can provide us with translations to their native language. Any translation help is more than welcome! Among other changes and fixes, a 'Sort By' field has been added to Advanced Report Subscriptions. A user can choose from one or more fields and the advanced report will be sorted by that field. For any questions, clarifications or for offering translation help, please contact TrakIT Support. TrakIT allows users to define services for a corridor. A service is basically a set of related events and data in a corridor. When creating new work orders, you may choose one or more services that the client has requested or the shipment demands. TrakIT has a list of pre-defined services for each type of corridor (Import, Export or Round-trip). These are defined in Admin > Master Tables > Corridor Services. A service can also be defined as a primary service (that appears in bold). If you need a new service to be defined here, please contact your Admin or SysAdmin and they will create it for you. Services are not automatically available in any corridor. Events must be linked to services explicitly in order for those services to be listed when creating a work order. As you may see, Customs Clearance can be defined as a service and it will include events 2 & 3. And, you may have two more services: Trucking Direct or Trucking to ICD, of which only one must be selected (i.e, they will be primary services). As you can see, events & data can be linked to more than one service. Events or Data items that are not linked to any service will always be included in a work order. The 'Services' filter on top lists all the services that the events are attached to. When a user creates a new work order, the following services will be listed: Customs Clearance, Trucking Direct & Trucking to ICD. Depending on the selection of services, the relevant events will be added to the work order. For example, if no service is selected, only events 1 & 8 will be available in the work order. If only Trucking Direct is selected, event 1, 4, 5, 6 & 8 will be used and so on for other services. A user may change the services selected for an active work order at any time - however, this may lead to some events being removed or added, so it must be done very carefully. Ideally, services should be selected while creating a work order. Avoid changing services later as this may lead to loss of populated events and data. The services selected for a work order can easily be exported in Custom or Advanced reports as well as the Operations page export. For any further questions or clarifications, please contact TrakIT Support. Important Notice: If you are getting a "Page Not Found" error when opening TrakIT, please delete any existing bookmarks and open TrakIT directly via the url. This is due to some internal page structure changes. For any assistance, contact TrakIT Support. Over the past few weeks, we have been working on streamlining TrakIT internally and enhancing the user interface to make it cleaner and simpler. The first phase of this transition is complete and we have made some changes to the way tables are displayed and the way users interact with tables. The majority of the change in internal and invisible. However, this has resulted in an average of 30% - 50% lighter pages (which translates directly to faster performance). The standard Edit and Delete buttons (along with any other) on each row have been moved to a popup that opens when you hover over the menu icon. The same has been applied to all the other tables. The page size of a table has been moved to the footer. Updates have been made to some pages only; the remaining ones will be updated in the next phase. If you experience any issues with the new interface, clear your browser cache, close all windows of your browser and then try again. If that doesn't help, please let us know. As per your request, Demurrage Notification emails will now have an Excel Attachment instead of the content being included in the email. A few more filters have been added to the Advanced Report 'WO Created' filter. 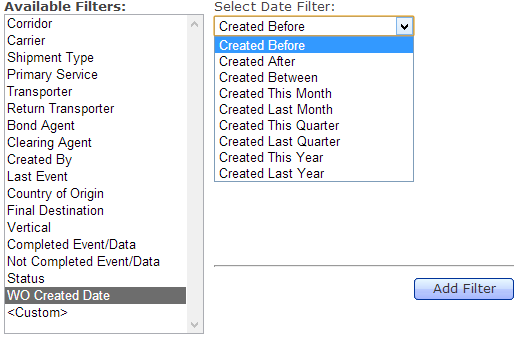 These filters will filter on the WO Created date on "rolling" basis from the current date. Over the next few months, we will be dropping support for Internet Explorer 7.0 due to the amount of time it takes our developers to ensure that the application looks and runs fine in IE 7.0. IE 7 users will now see a small exclamation icon on the top left of the browser window as a notice to upgrade. If you are using IE 8 and still seeing the icon, check your Compatibility View settings and make sure you are not using TrakIT in Compatibility mode (Turning on compatibility mode makes IE 8 behave just like IE 7). For those of you using IE 7, please contact your local IT support to upgrade to IE 8 or later and make sure Compatibility Mode is turned off. A new interactive report "Event Update Delay" is now available with the latest release (build 84). This report allows you to select specific corridors and analyse the time delay between the occurrence of an event and the time at which it was updated in TrakIT. Furthermore, for each event, you can see the users who have updated the event, their average delay and maximum delay. This will help in determining any data update bottlenecks in the shipment workflow. The delay is measured in days only. If a user updates an event on the same day as the occurrence of the event, it would mean a delay of 0 days. If the event is updated the next day, the delay would be 1 day and so on. The figures below include the number of events updated by each user and the average delay (in days) with one decimal. Shown below is a screenshot of the report. "Info Only" events, such as "ETA Vessel" are not included in the grouped Average Delay for the corridors. Such events are marked with a asterisk (*). As with all interactive reports, you can click on the hyper-linked figures to drill-down into the source work orders. The report can be exported to MS-Excel and includes all source data. The KPI graphs now include the Target line to compare the KPI with. Note that the target is the average of the targets set for the KPI among all selected corridors. For countries with non-standard weekends (e.g. Saudi Arabia), KPIs in business hours will now be calculated correctly. Now, you can select the weekend days for any country with non-standard weekends in the System > Country Holidays page. You can also set the public holidays in your country to let TrakIT skip those days when calculating Business hours. Make sure your KPIs in the corridor definitions are also set to the correct country and time zone to enable the correct calculation of business hours. By default, the Advanced Reports do not include work orders where the last event is more than 3 months ago. 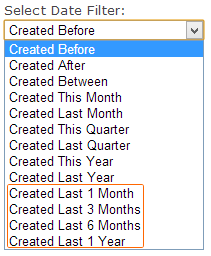 This can now be over-ridden using the new 'WO Created Date' filter in the Advanced Reports filter. You can choose from a list of options available. The first three options allow you to set specific dates, whereas the other options use the current date as the reference point. If this filter is not used, the default limit of 3 months is applicable. For each report subscription (customer, user or advanced), you can now specify a personalized message to be included in the report emails that are sent. A maximum of 500 characters are allowed in the message. Many other changes and fixes are included in this release. For any questions or queries, please contact TrakIT Support. User can now choose to receive daily notification emails when a container is about to reach the allowed Free Days beyond which Demurrage charges become payable, by selecting free days expiry notification in the application. From the main menu, select System > Email Notifications. 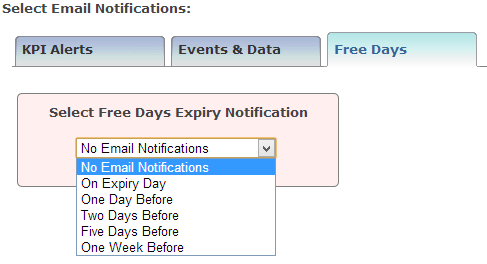 Select a corridor for which you wish to receive notifications and then click on the 'Free Days' tab. Notifications are sent every morning and include all containers with Free Days already expired as well as those that are about to expire as per above setting. The email includes links to the Entry Work Orders and calculated demurrage (if any), provided that the demurrage rates were set. Administrators can also subscribe users to demurrage email notifications via the Corridor Definition > Demurrage Definitions section. The subscriptions made by admins are automatically reflected in the user's email notifications and vice-versa. Event Updated Time & Date - This is the time and date that the event was actually last updated by a user and not the event date/time itself. Event Updated By - This provides the name of the user who last updated the event. Remarks Only - This option will export only the remarks entered by the user for the event. To get multiple options for the same event in the same report, simply add the same event many times to the field list, each time with a different required option. Data fields have similar options for export. Important Note: When time is exported in a field, it is set as per the corridor time zone (for Custom Reports) or the time zone set for the subscription (for Advanced Reports). Corridor Time Zones can be set in the Corridor Definitions for a corridor. The Weight field of a work order is now not a mandatory field. If not entered, the weight will simply be set as 0 kgs. Thus, you can create new work order by simply specifying the B/L details of the shipment and then selecting the number of containers/work orders to create. The dashboard filters are now similar to the Operations page filters. They can be customized by the user and will persist until cleared. Initially, no filters will be available for any user. Work Order Data can now hold multi-line text. When typing, simple press enter to switch to a new line. Corridor Cloning functionality has been removed to reduce complexity and related issues. All corridors are now independent and self contained. A new field called "Responsible Country" has been added to the Corridor Definition header. The field can be set from a list of countries to indicate which country is responsible for the corridor. The field can also be added as a filter in the Operations page or Dashboard page as well as used in the Custom or Advanced reports (only the country code is exported). Several other minor changes and fixes are included in this release. TrakIT build 80 has been released today with the re-designed finance module among other changes. It is recommended that users try and familiarize themselves with the functionality before using it for any live data. As this is the first release of the new finance module, we expect some changes, adjustments and optimizations over the next few weeks. The Corridor Definitions includes a section called "Shipment Financials" (previously called Corridor Estimates) where users can declare finance transactions expected for a shipment belonging to the corridor. Applies To - Whether the transaction applies to each work order or to the shipment as a whole. Default Estimate - A default value to be applied when transaction is created in a work order or shipment. VAT - The VAT rate (in percent) applicable on the transaction. When creating a transaction, you can choose to apply the transaction to all active work orders where the transaction is missing. This, however, does not update work orders where this transaction already exists. A corridor transaction definition cannot be modified (except for Default USD or VAT rate).This is to prevent accidental or inadvertent change of transaction types. Transactions can be updated by users of Financial profile or above. Once estimates are final, they can be approved by a user after which they are locked. Estimates can be "un-approved" again if they need to be changed. Estimates and Actuals can be included in Custom reports as well. At this stage, we're looking for feedback and suggestions to improve the finance module in TrakIT. There will be several more finance related features coming up in TrakIT. 1) The "Total Free Days" field has been removed from the Work Order Header as it is now redundant. When a container is added to the Container Tracking section, it obtains the Free days from the Demurrage Definitions defined for the corridor. 2) Subscription Title and Email fields have been added to the Advanced Report filters to help you locate subscriptions and recipients easily for Advanced Reports. 3) Excel Export of Interactive Reports - KPI Report, DQ Report & Active WO Report are now "un-grouped" and flat to enable better analysis in Excel. 4) The Work Order Status filter has been added to the Data Quality report. Several other changes and fixes have been included in this release. The demurrage definitions for a corridor now contains the container type. The rates are applied only when the container type matches. 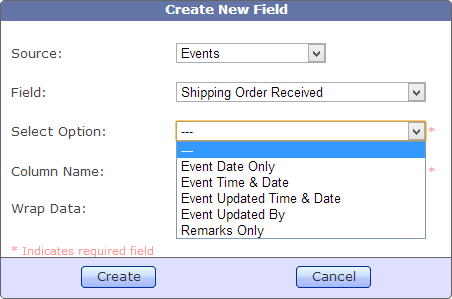 As a consequence, the Container Type field is now a mandatory field and can be selected when creating new work orders. The default container type is now 'General/Dry'. All work orders that did not have a container type selected are now set to the default container type. Please note that the container type of the work order must match the container type in the definitions exactly along with the other parameters. There is no definition that covers all container types. So therefore, rates for each Container Type must be explicitly defined for each combination of Carrier and/or Shipment Type. A new column 'Update Delay' has been added to the events table. This measures the average number of days between the event itself and the time it is updated. The actual delay is measured in days: A figure of zero means the event was updated the same day itself. A figure of one means it was updated the next. The Update Delay is the average of the delay in days. 'Info Only' columns such as ETA are not included in the grouped average for the corridor. The Entity Group filter has been added to the dashboard to enable users to see statistics of Entity Groups. In Custom or Advanced reports, users can now choose to export the remarks of the Event of Data item in a work order instead of the date or value of the Event or Data. For Custom or Advanced reports that are 'By Shipment', you can now select the earliest or latest event of all the work orders in the shipment. KPI fields in Custom or Advanced reports can be exported in days instead of hours. However, please note that the days will be either running days or business days depending on the KPI definition. The user interface has been tweaked and re-designed to provide simpler layouts, a more consistent and cleaner look. Further changes to the layout may be made over the next few builds.